In 1989, from April 15 when the Beijing student protests began, Jielian seemed especially concerned. Each day after school, he would go from Renmin University to Peking University to Tsinghua University, shuttling back and forth around these campuses, to look at and copy the contents of the large slogan placards and big character posters. After he came home, he would excitedly tell us about what he saw and heard. On the evening of April 19, he heard that students were demonstrating outside Xinhua Gate, the main entrance to Zhongnanhai, the central government compound. He said he must join them. We said it was too dangerous and didn’t let him go. He said he was only going to watch, and would call us when he arrived to tell us he was safe. We were still not comfortable with that so, in the end, his elder sister’s husband accompanied him there. Our son’s greatest concern was the safety of the students in Tiananmen Square. Many times he secretly went to the square late at night to help the university student order-maintenance team maintain order there. Each time, he would rush back to school for class at dawn on the day’s first public buses. During that period, our school’s Autonomous Students Organization set up a “Voice of Beijing” broadcast station at the campus gate. Each night, nearly a thousand people gathered there to listen to news about the student movement, frequently causing traffic jams. During those times, whenever our son was there, he always tied his beloved strip of red cloth around his forehead to volunteer in the order-maintenance team. One time, late at night, Jiang Peikun (蒋培坤)—Jielian’s father—was worried about him going out alone so he quietly watched him all night from a nearby street without Jielian knowing. Our son told us several times he wanted to join the blockading of the military vehicles, but was always dissuaded by us. But one night when we were sound asleep, he rode his bike alone to the Liuli Bridge in the western suburbs and didn’t come home until early morning the next day. As soon as he came in the house, he told us excitedly: Sure enough, the People’s Liberation Army soldiers had been duped. He said he made friends with a young soldier and told the soldier why the university students went on hunger strike. The soldier quietly told him that they didn't know what they were doing here and that they were each given a 90-yuan traveling stipend. The soldier said that, on the road, they were not allowed to read the newspaper or listen to the radio, and that they were all surrounded now and didn’t have food or water. That night, our son gave the soldier the bread and soda given to him by ordinary people, and even used his only two yuan to buy two jianbing [a snack similar to crepe ] and some fruit for the young soldier. That day after 4 p.m., when he and other Jiusan members had finished marching, Jiang rode his bike back to Renmin. As he was passing near the Fuxingmen overpass, he saw, from across the street, a contingent of demonstrators heading slowly towards Tiananmen Square. It was a group of bikes, each carrying two people—one person peddling with the other, sitting on the back of the bike, holding up a placard. All of them were wearing, diagonally across their bodies, broad strips of paper with various slogans. Jiang immediately spotted Jielian across the street, who also saw his father and motioned at him with a smile. Jielian’s bike was in the very first row of the group. Seated on the back of his bike was a classmate proudly holding the flag of the High School Affiliated to Renmin University of China. At that moment, Jiang was inexpressibly moved. He felt that his son had grown up, and the distance between him and his son had suddenly become smaller. At first, he had wanted to ride over and warn his son again, but the bike contingent had quickly moved on. That day, our son came home very late. Seeing that he was so fatigued, I didn’t have the heart to scold him. I silently prepared dinner for him and urged him to take a hot bath. That night all of us were troubled. My son told me that the school’s procession started with more than a thousand bicycles and more than two thousand people. He said that their march began after school that day. Initially, it went very smoothly, but once they got to the Fuxingmen overpass, there was no way to keep going so they put their bikes on the side of the road, reordered the group, and walked to Tiananmen Square. He said when they got to the square, it was already packed full and they could not enter, and so they just went all the way around the outside of the square. When they came back to Fuxingmen, the avenue was packed so tight that not even a drop of water could get through. They had to take a detour to the eastern suburbs and then the northern suburbs before they could ride back to school. He told me, on the way back, a female classmate was falling behind so he invited her to sit in front of him on his bike. Because his bike then had three people on it, he was so tired by the time they got back to school he could hardly move. 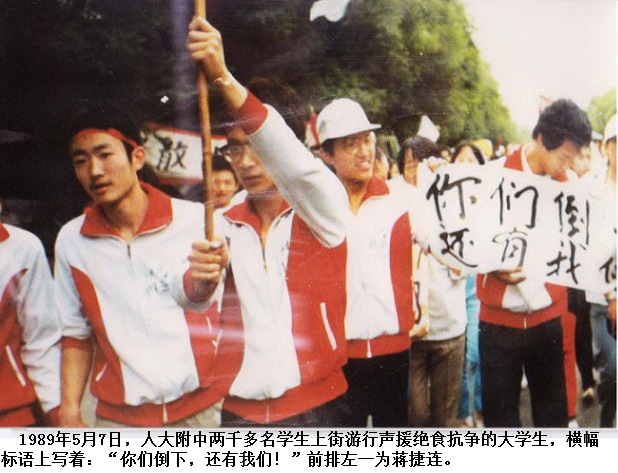 On May 7, 1989, over a thousand students from the High School Affiliated to Renmin University of China marched in support of the university students on hunger strike. The banner says: “When you fall, you still have us!” Jiang Jielian is on left. We found out later that this was the first time that Beijing secondary school students went to Tiananmen Square to support the university students on hunger strike. Later we also learned from Jielian’s classmates that this march was organized by Jielian and several of his classmates. This was why he and his classmates stayed in the very front of the group. We have kept pictures of that march. One of them shows the marchers in front holding up a banner that says: “When you fall, you still have us!” The words were emblazoned in black letters on a white background, unusually striking. This precious shot, which gives us such happy memories, was secretly taken by a female classmate also in the march. In elementary school, our son was classmates with this girl; after he died, her mother (who was also Jielian’s elementary school math teacher and class director) gave this picture to us. We are eternally grateful to her because this is the last photo of our son alive. On the night of June 3, the sky was overcast, and it was muggy and oppressive. We planned to go for a walk around campus after dinner. If our son wanted to, we would have brought him with us. Prior to this, for three straight days, Jielian stayed home after school and didn’t go out. And after dinner each night, he immediately sat down at his desk and worked on his long papers until very late, going to bed at two or three o’clock in the morning. When I realized how tired he was, I asked him: “Didn’t midterm exams just end? How come you are working so seriously?” He said, looking earnest and jestful at the same time: “Don’t you always tell me not to wait until right before the exam to start studying? I am just studying for finals early!” I thought he was pulling my leg because previously each time after exams, he always wanted to have his fill of fun and rest for a while. But this time, I didn’t question him again. I was afraid he would think I was nagging him. I didn’t know until after he died that because his grades on the midterms that time were excellent (he scored 570 points on 6 subjects, a 95-point average), he had already been chosen by the school to be their representative at the upcoming Beijing Physics Olympics competition. He was going full steam preparing for this competition, but he kept this from us the whole time, until he left us. After dinner that night, we prepared to go out. Unexpectedly, the situation in Beijing suddenly changed. On television, we saw broadcast after broadcast repeat the urgent notice from the martial law troops, saying that the government was planning some sort of action, and urging citizens throughout the city to stay home, or else accept the consequences. We could tell from the broadcasters' unusual expression and hurried intonation that something serious was going to happen. Ever since martial law was announced [on May 20], we'd heard repeated news reports that the army was going to come into the city, and so we suspected that this time the troops would really come into Beijing. We decided to stay home and not go out again. But as soon as our son heard the urgent notice, he could no longer stay put. He anxiously asked us: "What should we do? What should we do? There are still so many university students in Tiananmen Square." I told him: "Nothing. The only thing that could be done was for Beijingers to take to the streets and go to the square, but now even that can’t be done." I pleaded with him: "It's too dangerous outside, don't go out again." But he was anxious to go out, and criticized me for being a coward. His father and I agreed to go with him to campus to see what was going on. I thought, movies were usually shown at the school auditorium during the weekend, so we would go with him to see a movie. Maybe that would calm him down. But I didn't realize that the auditorium would be blocked that day, and at the door, there wasn’t a single person in sight. Only then did we know that the weekend movie had been canceled. At this point, we began walking toward the east gate of the university, the hub for news on what was happening. On the way there, we patiently continued to try to persuade our son. His father said to him: "Your older brother and sister are already married, and you're now the only one at our side; if something were to happen to you, your mother and I would have only one another the rest of our lives." He was not only completely unmoved by his father's words, but replied disapprovingly: "So what if you end up having only one another. If all parents were as selfish as you, wouldn't it be the end for the country and people?" Perhaps he just didn't understand the severity of the situation, or maybe he was already determined to be with his brothers and sisters in Tiananmen Square. We could tell that he had already made up his mind to go. At the gate of the university, he tried several times to sneak away from us, but we stopped him. At the time, the empty spaces on both sides of the gate were already packed with people. A broadcast unit set up in a nearby dormitory was continuously broadcasting news about the movement of martial law troops in the city; it also sent out repeated appeals to the students and residents saying that the situation in Tiananmen Square was critical, and urging people to go there to give their support. At this time, we saw chaotic crowds of people on the street outside the university gate rushing in the direction where the martial law soldiers were entering the city. We sensed that the people of Beijing and the martial law troops could well end up in a massive clash this time, and so we couldn't stay out for long. We tried everything to talk our son out of staying and then had to drag him back home. After we got home, his father couldn’t settle down, and so he asked me to stay home and keep an eye on our son while he went back again to the university gate, saying he would come home as soon as he had news about what was happening. I understood my son. If he wanted to do something, he wouldn’t stop until he reached his goal. Seeing him walking back and forth in the apartment, distracted, I simply locked the front door as a precaution, just in case. But he seemed to have been set in his mind—he no longer listened to me, and silently prepared to go out. He pinned my small red school badge (all of the teacher badges were red) on his chest. (He had already lent his own school badge to a classmate and his student ID had been lost during the demonstrations.) He put some 2-yuan notes and some coins in his small wallet. The last thing he did was put his father's bicycle key into his own pocket. After that, he comforted me: “I'm going to take a look, and will be back very soon. If you're worried about me, as soon as I get there (Tiananmen Square) I'll find a public phone and call home.” Patting the school badge on his chest, he said to me, “With this amulet, they won't think I'm a ‘hooligan,’ and the martial law troops won't hurt me.” I thought that, at that moment, he must have been thinking about the young soldier he'd met at the Liuli Bridge earlier when he joined in blocking military vehicles from coming into the city. He told us at the time that he'd made friends with the young soldier. That was how naive my son was and how ignorant he was about how the world worked. He had no idea why the government had sent so many military troops into Beijing! He also didn't understand that the duty of soldiers was to obey the orders of their superiors. I begged him for more than an hour, saying that, no matter what, I wouldn't let him leave the house. Perhaps he couldn't bear to break my heart, and so he finally sat down with me on the small sofa in the living room. I switched on the TV, but all of the channels were broadcasting the urgent notice of the martial law troops, and so I just turned it off. But he could no longer sit still. Catching me off guard, he ran into the bathroom and bolted the door. I thought he was planning to jump out the window (our dormitory apartment was on the first floor of the building), and so I rushed to the door and pounded hard. I shouted for a long time. No response. I fell to the floor and grabbed on to the doorframe in despair, as if heaven and earth had collapsed right in front of my eyes. But in a little while, the bathroom door opened, and my son was there standing before me. He said in a gentle tone: "What are you worried about! I didn't go anywhere, am I not all right?" I pulled him tight toward me, not letting go. He sat down next to me, apologetically. I thought to myself that no matter what, I had to calm him down. But soon, he pushed me aside and rushed toward the bathroom again, but this time I caught up with him at the door and grabbed onto his clothes. I said to him: “You're just a high school student, even if you go, what can you do?” He answered with the words of an Olympic athlete: “What’s important is not what you do, but that you participate.” After saying this, he turned around toward me and kissed me lightly on the cheek, saying: "This is good-bye." With that, he yanked himself from me and ran into the bathroom and bolted the door. Again, I banged at the door furiously. But this time, there was no response. My mind went blank and I didn't even have the strength to hold myself up. When I came to, I knocked at the door, and discovered that the bolt was open, but the bathroom was empty—he'd already left through the window. I ran out the door like a mad woman and circled the house calling his name. But everything was enveloped in darkness, not even a shadow could be seen. It never dawned on me that we were parting forever. My son's running away instantly plunged my family and me into an abyss from which we could not escape. That evening, Jiang wandered around the East Gate of the university for more than an hour. At that time, people all realized, based on information from many different sources, that the movement of the martial law troops this time was clearly different from before. Not only were more troops mobilized, but they also appeared ferocious; thus this time they couldn’t be stopped and forced back like before. They felt that the troops moving into Tiananmen Square was only a matter of time. Based on this realization, everyone decided that the most important thing was for the students to immediately evacuate the square to avoid unnecessary harm. The deterioration and danger of the situation were already beyond doubt, but people seemed to still be holding onto some fantasy, including older people who had been through a lot in their lives. They all didn’t want to think the worst, and didn’t think the troops would actually use real guns and bullets against unarmed civilians. Close to 11 o’clock, Jiang saw that there wasn’t much going on [at the school gate] and returned home; but he did not realize that our son had already left, not even a half hour before. As soon as I saw Jiang, I began to cry loudly and beat him with my fists, blaming him for not coming home sooner. Since that fit of anger, I have never again in more than 20 years blamed him, and never even spoken a single word about that moment again. This has become our family’s taboo subject. I am fully aware that the pain Jiang feels over losing Jielian is no less than mine—after all, it was in his cooing and coaxing that Jielian grew up. It’s only that Jiang is introverted, and he can control himself more than I. The situation did not allow us to hesitate. Jiang and I immediately rushed to the East Gate of the university, thinking that maybe our son had not yet left the campus, and that maybe we could find him there. But once we got there, the situation before our eyes was completely different: gunshots could be heard from far away; the crowd was in an uproar; students were running frantically back to campus. Someone held up some blood stained clothes and shouted nonstop: the troops are firing! Shooting people dead! In an instant, chaos and terror reigned inside and outside of campus. People were all dumbfounded by this unforeseen turn of events. When everyone calmed down, they seemed to have understood what was happening before their eyes. They huddled, talked anxiously, gasped in anger. Some parents and elderly people pushed their way through the jumbled crowd, searching all around for their loved ones and children who had not yet returned. Perhaps all people in disasters would feel that they would be lucky. In this moment, we could do little else. Our only hope was to find out where our son was as soon as possible. We asked with every person we knew, and described what our son looked like to every person coming back to the school. But our hope was dashed again and again. We stood for a long time on the road outside the gate, looking carefully at each person who walked by us; we walked back and forth among crowds of people heading in different directions hoping for some unexpected discovery, saying to ourselves that our son is 5 feet, 10 inches tall and we'd definitely be able to find him. But our hope faded as each second and minute passed. At this very moment, we had no other choice. Wait, and then wait again—it was the only thing we could do. During this waiting without hope, we suddenly thought of what our son said earlier. He promised to telephone us when he got to his destination. We trusted our son deeply, and that he would not let his parents worry about him. We also remembered another occasion, on April 19, when he went to Xinhua Gate, and he called us at home to let us know he was safe and sound. And so we decided that Jiang would stay around the university gate by himself while I went home to wait. I thought that if I would hear from my son, I'd brave a hail of bullets to find him and bring him home. But during this night, we traveled back and forth between home and the university gate seven or eight times, but in the end, we never got a call from our son. I had a premonition that misfortune was coming toward us step by step, and that a disaster was about to crash on us. One o'clock, two o'clock, three o'clock, deep into the night, we could still hear the continuous sound of concentrated rifle fire and shouting from afar. We saw with our own eyes people pushing flatbed tricycles piled with wounded people racing right past us one after another, and trails of blood on the street stretching far into the distance. My heart was beating fast, and, in my mind, the pallid face of my son came dimly into view. It couldn’t be that my son had also met this fate! We huddled tightly, not daring to think about anything. As time passed, news kept coming in that the number of wounded and killed at the scene had increased sharply, with corpses strewn all over the main streets and hospitals filled with the wounded. The entire Beijing had become a city of the dead. We didn't dare leave our spot, and waited there numbly, scenes of blood-soaked white bandages and other ghastly sights flashing across our minds. We felt as if we'd traveled to a faraway place, and everything that was happening there was just a haze. We spent a sleepless, nightmarish night struggling between hope and despair. Early the next morning, we dragged our exhausted and numb bodies back home. What would await us in this new day? We realized we should go out and look for our son. But in such a large city as Beijing, where would we even start to look? A little after 6:00 a.m. on the morning of June 4, a young man who looked like a student came to our house accompanied by his father, and said he was Jielian's classmate. He told us that Jielian had been seriously wounded, lost a lot of blood, and had been sent to a hospital, but that he didn't know which one. He went on to tell us what had happened. He said that at around 10:30 p.m., he'd run into Jielian at the gate of Renmin University riding a black bicycle, and that Jielian invited him to go to Tiananmen Square together. At first, the classmate didn't want to go, but he agreed in the end. Just as they were riding past the end of the Muxidi Bridge, they saw that the area was packed with people, and they could hear intermittent shouting in the distance. Meanwhile, the street at the western end of the bridge was full of armored personnel carriers and rows of martial law troops ready for action. The entire street was blocked, and vehicles and people were unable to pass. They left the bicycles on a nearby patch of grass. He said that at this very moment, the martial law troops opened fire, with a concentration of bullets strafing the crowd of people around them. At first, they thought they were rubber bullets. But seeing the rifle flashes on the street and the crowd scattered to avoid being hit, they hid behind a flower terrace south of Building No. 29, on the north side of the north exit of the Muxidi subway station. Just then, the strafing by machine guns and automatic weapons escalated. Suddenly, a bullet struck Jielian's back, and another bullet shattered his ankle bone. The classmate said he heard Jielian saying to him casually: "I think I've been hit! Get out of here!" After saying this, Jielian staggered for a few steps, then squatted down, and passed out on the ground, his t-shirt soaked in blood. He said that people in the vicinity braved the gunfire to carry Jielian to a doorway on the north side of Building No. 29. Seeing that his injury was serious, they immediately got a flatbed pedicab and put him on it. On the way to the hospital, they stopped a small taxi, and two strangers transferred the unconscious Jielian into the car. The classmate said that a woman was already in the taxi and that it was impossible for him to squeeze into the car with my son. He didn't know which hospital the taxi took Jielian to. He said that he had ridden the bicycle to visit many hospitals, but couldn't find Jielian. After we heard this news, we actually calmed down. We first wanted to know if our son was dead or alive. I calmly asked one question: “Did the bullet hit his right side or left side?” The classmate didn't dare say a single word, and his father quietly answered for his son: “It was the left side.” After hearing this, my legs became weak and I fell to the ground; only after quite a while did I slowly regain consciousness. At that moment, we had only one thought and that was to find out where our son was as soon as possible. As long as he was alive and could come home to us, even if he became permanently disabled and needed us to care for him the rest of his life, we could accept that. After this sudden blow, I completely lost the ability to hold myself up. During this time of disaster I have to thank heaven for our students, colleagues, and neighbors, who, although they had also spent a sleepless night like we did, showed no concern for their own safety and immediately went out with our relatives. They ignored the danger posed by the bullets of the martial law troops and spread out like a net to visit every hospital in Beijing to look for our son. On June 4, Beijing was like a city that had gone through a violent war. The cries that had not long before reverberated throughout the night had stopped, but sporadic stray bullets could still be heard whizzing through the air around the city; the smell of gunpowder permeated the streets; there were abandoned tanks and military vehicles all over the place, and bloodstains everywhere…All of the trees, flowers, plants, and buildings on both sides of the streets seemed to be hanging their heads low, weeping for the catastrophe that the ancient city had suffered. Jiang, one of his students, Jielian’s older brother and brother-in-law went to a string of hospitals. They stepped over dark red bloodstains to reach the temporary medical wards that were full of the wounded. Hoping for luck, they checked the wounded one by one. They came to a temporary surgical ward, and Jiang was anxiously hoping to find our son on one of the operating tables. They pulled out a photograph of Jielian and inquired about him with every doctor and nurse they could find. Finally, they came to a courtyard where the dead were being kept, and again they looked at corpse after corpse. We couldn’t find our son, in any of the hospitals or other places we visited, alive or dead. Editor’s note: This is an edited version of Part 12 of a 14-part essay. Click here to read the entire essay in Chinese. The Jiusan Society is one of the eight officially recognized political parties in China and follows the direction of the CPC. It is named after the month and day—September 3, 1945—of Chinese victory over Japan at the end of the Second World War.